Fixture groups allow you to organize fixtures that are included in your Patch in clusters and then to control them together as a group. Note: Fixture groups are part of the Patch. Changing the Patch will likely result in changes to the Fixture Groups as well. 1] Manage your fixture groups. 2] Control your fixture groups. Fixture Groups are managed in the Patch Editor. Within the Patch Editor, a dedicated menu is available. All items from the menu shown above are also available for quick access in the toolbar of the Patch Editor. 2] A new window opens. - Choose a name that helps you easily identify the fixture group later. - The ID is a unique identifier for this specific fixture group. - Each fixture group must have a different ID! ▪ The new fixture group will be created. The fixture group will not yet include any fixtures. 1] First, select all the fixtures you wish to include in the fixture group. 3] A new window opens. - Each fixture group must have a different ID. ▪ The new fixture group will be created. All previously selected fixtures will already be assigned to the fixture group. Expand List - Shows the fixture groups including the fixtures that are assigned to the fixture groups. Collapse List - Shows only the fixture groups. Expand Item - Shows the fixture group and extends the list to show the fixtures assigned to this particular fixture group. Collapse Item - Shows the fixture group but hides the fixture assigned to this particular fixture group. Fixture Group Selection - Shows the currently selected fixture group. Fixture Selection - Shows the currently selected fixtures of a fixture group. 1] Select all fixtures you wish to assign to an existing fixture group. 2] Select the fixture group or multiple fixture groups in the fixture group list in the bottom left of the Patch Editor. Both, fixtures and fixture groups, will now be selected in the Patch Editor. ▪ The Patch Editor will assign all selected fixtures to the selected fixture groups. 1] Select all fixtures you wish to release. ▪ The Patch Editor will release all selected fixtures from all selected fixture groups. ▪ The Patch Editor will release all selected fixtures from all the fixture groups they are currently assigned to. 1] Select all fixture groups you wish to remove. ▪ The Patch Editor will remove all selected fixture groups from the Patch. ▪ Select a fixture group [to the left of the Patch Editor] in order to change its settings [to the right of the Patch Editor]. ▪ You can also select multiple fixture groups in order to change their settings. ▪ Display Color - Allows you to change the individual color for the fixture group. - This color is useful to distinguish between fixture groups when controlling them in the Group Control view. ▪ ID - Defines the unique identifier for the selected fixture group. ▪ Default Value - Defines the standard value of a fixture group fader. This is important when launching the Group Control for the first time and when restoring the default values in the Group Control view. - Valid values range from 0 to 255 [0% to 100% intensity]. By default, the default is set to 255. ▪ Minimum Value - Defines the lowest value a fixture group can be set to. - Setting a fixture group fader to 0 will set the intensity to this Minimum Value. - Valid values range from 0 to 255 [0% to 100% intensity]. By default, the default is set to 0. ▪ Maximum Value - Defines the highest value a fixture group can be set to. - Setting a fixture group fader to 255 will set the intensity to this Maximum Value. ▪ OK - Always confirm any changes with OK.
▪ Reset - Allows you to discard changes before having confirmed any changes in order to use the values that were set up last. ▪ First, make sure to create fixture groups in the Patch Editor. - Otherwise, the Group Control view will be empty and no fixture group can be controlled. Fixture groups are controlled in the Group Control view. ▪ Or click Programmer > Group Control on the user interface. ▪ Or click Group Control > Programmer on the user interface. ▪ The Group Control view will include a fader for each fixture group you have created. ▪ Use the fader of a fixture group to control its intensity. ▪ Each fader regulates the intensity of a single fixture group. - You can set the fader to a specific position. - You can enter a value in the input field. - You can flash the fader. ▪ You will immediately see the changes in the Preview Output. ▪ When controlling fixture groups, your settings will be immediately applied and visible on the output/the LEDs! - A single fader regulates the intensity of a single fixture group. - Left Arrow / Right Arrow - Quickly switch between faders by using the left or right arrow key. - Use Ctrl + Left Mouse Click to select multiple faders at the same time. A green outline will show that a Layer is selected. When multiple faders are selected, you can control them at the same time. - Use Shift + Left Mouse Click to select multiple faders at the same time. A green outline will show that a Layer is selected. When multiple faders are selected, you can control them at the same time. - Ctrl+A - Selects all faders of the Group Control. - Ctrl+D - Deselects the current fader selection. - It instantly sets the intensity to 255 as long as you hold the button/key down. - To use this feature, the fader needs to be set to a lower value than 255 first. ▪ A fixture group fader in the Group Control view always ranges from 0 to 255, independently of what Minimum Value or Maximum Value you have defined for the fixture group. ▪ Setting a fixture group fader to 0 will set the lowest intensity for this fixture group as defined by Minimum Value. - That means that a fader set to 0 will not necessarily set the intensity of the fixture group to 0. Instead, it will be set to the minimum value you defined. ▪ Setting a fixture group fader to 255 will set the highest intensity for this fixture group as defined by Maximum Value. - That means that a fader set to 255 will not necessarily set the intensity of the fixture group to 255. Instead, it will be set to the maximum value you defined. ▪ Overwrites the Default Value as defined in the Patch Editor with the current fader position of the Group Control for each fixture group individually. 1] Set each fixture group fader to its required position. 2] Enter a description for the Group Preset. 4] A new window opens. - Your Group Preset will be saved there. - Valid values range from 1 to 256. - MADRIX will automatically suggest the next free Group Preset number [which is one number higher than the currently highest preset number]. 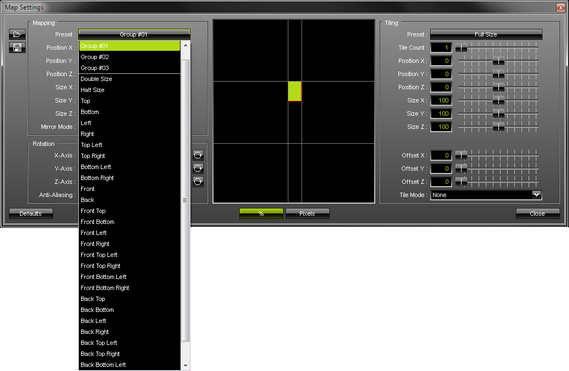 5] MADRIX will save the currently set fader positions as a Group Preset. - Saved presets will be shown as blue on the left side of the Group Control view. - Empty Group Presets are deactivated and shown in gray. ▪ Left Click - Calls a previously saved Group Preset. MADRIX will automatically fade according to the Fade-In Time. - Make sure to click on preset number shown in blue. - An activated Group Preset will be shown in green for a short while. This indicates that it has been activated. ▪ Left Mouse Double-Click - Calls a previously saved Group Preset and activate it immediately without using the Fade-In Time. - Note: MADRIX will not automatically overwrite a Group Preset! Fade-In Time - Defines the duration of the automatic fade between fader positions [in s], when selecting a different Group Preset. - A value of 0 means that no fade-in is applied. Faders will be set immediately to their new positions [using a hard transation]. ▪ Right Mouse Click on a Group Preset number to quickly perform various actions. Set - Saves the current group values as Group Preset to this Group Preset number. Open... - Loads a previously saved MADRIX Group Preset file [of the file type *.mgpz or *.mgpx]. A new window opens for you to select the file on your harddisk. Copy - Copies a previously saved Group Preset into the clipboard as a duplicate. Paste - Inserts a copy of a Group Preset from the clipboard into the currently focused Group Preset. Clear - Removes the currently focused Group Preset. ▪ Click on the Group Control Options button to open a submenu. Open... - Loads a previously saved MADRIX Group Control file [of the file type *.mgcz or *.mgcx]. A new window opens for you to select the file on your harddisk. Clear - Removes all Group Presets and restores the default Fade-In Time. Group Value Chaser - Allows you to chase group values. - The Group Value Chaser will also be saved when saving a Group Preset. ▪ Left Mouse Click And 2 Sec. Hold - You can perform a Copy and Paste with the mouse. Use a left mouse click on a Group Preset and continue to hold for 2 seconds. A small + appears. Continue to hold and move your mouse to another Group Preset number. Release the mouse button to paste a copy onto the new Group Preset. ▪ Left Mouse Click And 2 Sec. Hold + Shift - You can perform a Cut and Paste with the mouse. Use a left mouse click on a Group Preset and continue to hold for 2 seconds. Press Shift in addition. A small rectangle appears. Continue to hold the buttons and keys and move your mouse to anotherGroup Preset number. Release the mouse button to move the previously selected Group Preset to the new position. ▪ File Drag And Drop - You can select a MADRIX Group Preset file [of the file type *.mgpz or *.mgpx] in Windows and drag it to a Group Preset of your choice in MADRIX in order to load it in MADRIX. In addition to controlling fixture groups directly in the Group Control, you can use fixture groups in other ways. Since fixture groups include specific fixtures, these fixtures cover a well-defined area of the Patch. As such, you can use a fixture group as preset for the Map Settings of a Layer. ▪ Select the fixture group from the list. ▪ MADRIX will automatically set the correct Map Settings. - The Mapping or Tiling will be repositioned and resized according to the fixture group. - The adjusted Map Settings will always be a rectangular selection since MADRIX uses the bounding box of the fixture group with only its largest dimensions in X, Y, and Z. Controlling fixture groups in the Group Control view is mainly a live feature that works independently of other controls, such as Storage Places for example. But you can further integrate Group Presets into your workflow. You can use the Cue List to trigger Group Presets for each Cue. ▪ Open the Cue List and make sure to set up the Group Preset for a Cue where required.